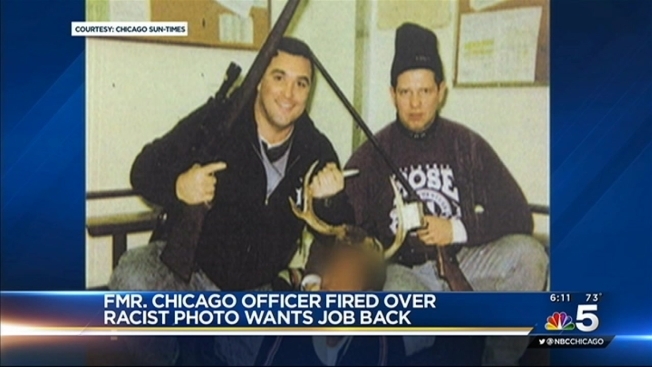 A photo of two white Chicago police officers posing with rifles as they stand over a black man lying on his stomach with deer antlers on his head has sparked outrage. The photo, showing Officers Timothy McDermott and Jerome Finnigan, was published Tuesday by the Chicago Sun-Times. It was released in March by a Cook County, Illinois, judge and is believed to have been taken in a West Side police station between 1999 and 2003, the Sun-Times reports. The Polaroid image was given to the police department in January of 2013 and immediately prompted an investigation that led to McDermott being fired in 2014, police said Wednesday. McDermott was stripped of his police powers and charges were filed with the Police Board, which terminated him in October of 2014. “This picture is disgusting," Police Supt. Garry McCarthy said in a statement issued to NBC Chicago, "and the despicable actions of these two former officers have no place in our police department or in our society." McDermott has reportedly appealed to a dismissal court, but attorneys for the police department and McDermott asked that the photo be sealed earlier this year. The judge refused that request in March and the photo was recently obtained by the Sun-Times. The other officer in the photo, Finnigan, is also the face of a scandal involving the Special Operations Section of the police department and is currently serving a 12-year sentence in a federal prison in Florida. He pleaded guilty to charges in a murder-for-hire scheme and income tax evasion, relating to money he stole as a police officer. The man in the photo has not been identified.